To maintain plant equipment for production in good condition at reasonable cost, it is important to monitor equipment conditions. This requires a wide range of online diagnoses to cover many types of equipment and handle the diagnostic results in a consistent manner. 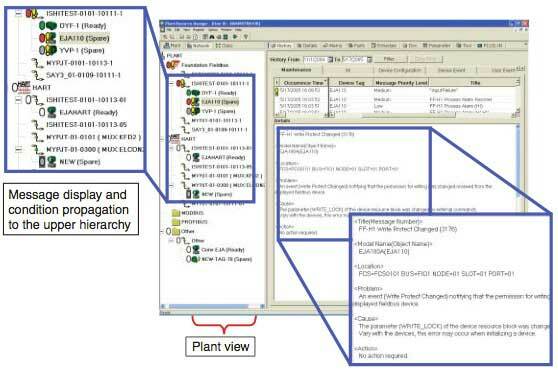 This paper describes how PRM (Plant Resource Manager), a plant asset management system of Yokogawa Electric, performs online diagnoses through functional collaboration with instruments and how it handles the diagnostic results in a consistent way. Asset Excellence (AE) provides a set of solutions for maintaining a plant in good condition at reasonable cost to ensure that it works as a production infrastructure. To reduce maintenance costs without causing a risk to production, it is necessary to change from breakdown maintenance to predictive or preventive maintenance. To accurately monitor the states of equipment and units more effectively at lower costs, it is essential to accelerate online diagnosis and provide a scheme for integrally managing and taking advantage of a lot of diagnosis information for maintenance. To achieve this, we have employed a field network in the unified diagnoses management software package PRM (Figure 1). Most plant maintenance operations are performed on site and are based on inspections using the five senses of individuals combined with physical adjustments , repairs, etc. using tools. As a result, electronic data on maintenance and information derived from it have not been collected and processed by computer. However, the situation has been changing in the past few years and microprocessors are now being built into field device to store valuable data. In addition, the popular field bus enables data to be accessed from outside and some field device now offers diagnostic functions and can automatically generate diagnosis result information. Diagnosis refers to a series of operations for collecting and analyzing various data, judging the state of the target equipment or units and notifying the result by an appropriate means. For example, the following operations are performed in valve diagnosis. Presuming for abraded packing or deteriorated plugs, etc. Although there are many tools for diagnosis, it is impossible to significantly increase the number of objects that can be diagnosed or the frequency of diagnosis so long as operator intervention is required. Online diagnosis means that diagnosis is done automatically and continues without operator intervention; the aim is to automate all the operations (1) to (3). This requires that the field device and the equipment management system closely cooperate with each other. In particular, online diagnosis messages in (3) need to be issued to operators in a consistent style to ensure that the same action is taken in response to the message received or that information contained in the message can be reused later. Online diagnosis realization requires the use of three functional elements: a sensing function for collecting data about the object to be diagnosed, a diagnosis engine function for applying a diagnosis algorithm to collected data for judgment, and a message generation/handling function for notifying the operator of the diagnosis results. For example, when broken wire is detected in a resistance temperature detector, these three functions work in combination as below. First, the voltage and current of the resistance temperature detector are measured (via the sensing function), a resistance value is obtained by measured voltage dividing by measured current and compared with a normal range of values to determine whether it is abnormal (via the diagnosis engine function), and then a message indicating a broken wire location is issued to an operator with a timestamp so that the operator can understand the contents of the message (via the message generation/handling function). To implement various online diagnoses, above three functional elements must be used appropriately. To implement as many online diagnoses as necessary and manage them integrally, PRM has been configured so that the user can flexibly select its coverage. Figure 2 shows the functional elements required for online diagnosis and their installation locations. In the lower part of this figure, the objects to be diagnosed are classified and the installation locations of functional elements for diagnosis are indicated within the rectangles. 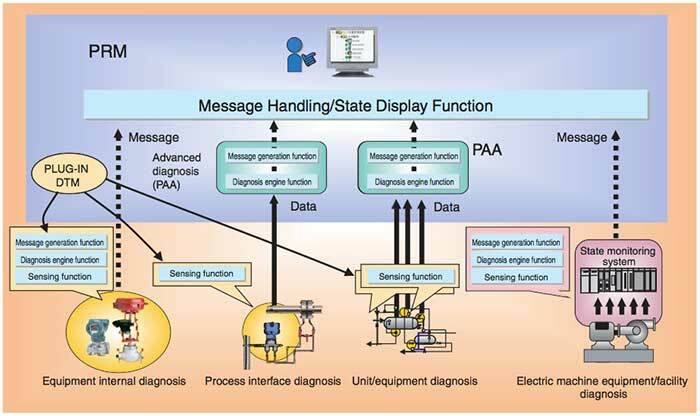 The message handling function and state display function both reside in PRM but the diagnosis engine and the message generation function are implemented in different locations depending on what objects are diagnosed. The process of diagnosis is described below. This diagnosis detects above broken wire of the resistance temperature detector or an electronic circuit fault in field device, etc. The function is implemented in the equipment together with the sensing function, diagnosis engine and message generation function, and the message handling function is performed by PRM. To activate the diagnosis engine in the field device, it is necessary to set the mode and conditions. Generally, a PC is used to do this because the user interface of equipment is limited. 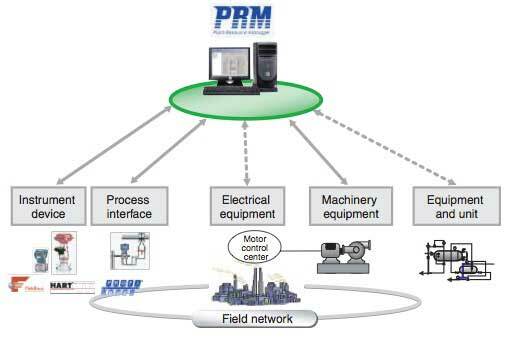 PRM supports operating the built-in programs called PLUG-IN and DTM (Device Type Manager) to change settings for remote equipment. This diagnosis examines interfaces between equipment and processes rather than equipment. For example, on an impulse line which conveys an orifice differential pressure to a differential pressure transmitter, the diagnosis focuses an impulse line blockage to detect a minute swing in pressure. Process interface diagnosis cannot always be implemented within the equipment. The application in the equipment may not have sufficient performance for a complicated algorithm employed for diagnosis or long-term trend information may be required for diagnosis. For this reason, PRM has a diagnosis engine function called the PRM Advanced Diagnosis Application (PAA) and allows a more complicated diagnosis by using the parameters primarily processed by the equipment. In the diagnosis shown in the above blockage diagnosis example, trend data saved in PRM for several years is used to detect progressively- worsening blockage. Diagnosis range by the equipment alone is limited to that based on information collected via its own sensors. In contrast, when it is possible to use information over multiple units, the coverage of diagnosis can be extended. For example, if the correlation between the degree of valve opening and the flow is available, it is possible to detect erosion and corrosion in the valve plug. When it is possible to measure an I/O flow, pressure or temperature in a device such as a heat exchanger, a decrease in heat conductivity efficiency or a break in a minute channel can be diagnosed. In this case, the field device performs only sensing and the diagnosis engine mainly uses PAA. Occasionally, critical facilities such as turbines and compressors are provided with diagnosis systems developed by specialized manufacturers (Figure 3). For example, a vibration monitoring system consists of dedicated sensors, diagnosis execution hardware and a Human Machine Interface (HMI) for making settings and displaying the states. For PRM, functions for accepting information from such a system, interpreting it via the handling function and notifying the operator of its contents are being developed. These functions will make it possible to do unified management of all the diagnosis information under PRM. The preceding section described the role of PRM. This section describes which functions are used by PRM to actually support online diagnosis. Figure 4 shows a typical screen example for the message display function by PRM. The pane on the left side of the screen is called an plant view and it hierarchically lists all units under PRM management. In this pane, the icon corresponding to the type of each unit is used and the condition of the unit is indicated by a red or green ellipse displayed to the left of the icon. This list contains the unit's self- diagnosis results displayed in a unified form by PRM. Because unit conditions are displayed in the upper folders through propagation in the hierarchy, it is possible to easily determine the presence or absence of abnormity at the top folder. The pane on the right side of the screen displays information concerning the equipment selected via the plant view. This screen example shows the message interpreted and issued to the maintenance personnel by PRM. The intuitive interface for displaying messages is similar to e- mail. A list of received messages is displayed in the upper half of the screen and their contents are displayed in the lower half. In addition, a flag (!) indicating whether a message has been read facilitates message management. Messages sent to the maintenance personnel can be accumulated in the database and can be retrieved under various conditions. It is difficult to consistently manage messages that are interpreted and displayed without processing. 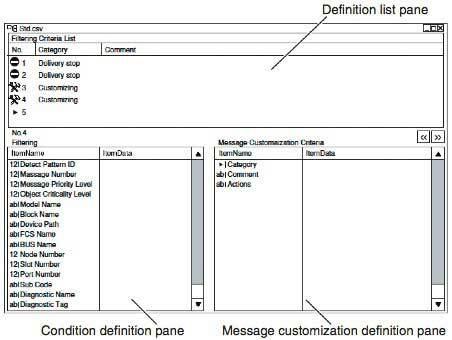 For this reason, PRM provides a function for customizing the contents of a particular message as a message filter function, in addition to a function for accepting or rejecting message delivery. Figure 5 shows the message filter setting screen. Filters can be set by destination (maintenance personnel and operator). In addition, a simulation function can be used to confirm the effects of filter settings. To create a good diagnosis algorithm, it is essential to make full use of know-how on the objects to be diagnosed as well as ideal theory. For units and equipment in a plant, it is especially effective to prepare diagnosis algorithms according to how they are used in the plant. PAA has assigned high priority to ease of coding, assuming that the algorithms are written by those who have a good knowledge of diagnosis. 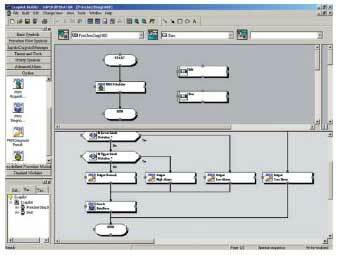 Concretely, PAA uses an intuitive, icon-based GUI (Graphical User Interface) rather than programmer-oriented VC and VB. In this interface, conditional branch icons and processing icons can be placed and connected on the screen to describe the target logic (Figure 6). This function is based on our field-proven ExaPilot user interface which has been marketed for non-routine operation support in DCS. Online diagnosis is particularly valuable for predicting future states, namely predictive diagnosis as well as diagnosing present states. When predicting the state of plant equipment in future, it is useful to know the past conditions of equipment as in other fields. For this purpose, PRM has employed a true historian since R3.01 released in the autumn of 2006 to enable 60,000 data items to be collected and stored for long periods. In the coming years, PRM will offer various ways of using historical data to confirm the effectiveness of a diagnosis algorithm in addition to simple methods for predicting the future by using data extracted from trend data. To enrich online diagnosis over the entire plant, it is necessary to cooperate with field device vendors and state monitoring system vendors. To achieve this, we have employed an open framework called FDT/DTM (Field Device Tool/Device Type Manager) to reduce the workload of developing programs for equipment. We have also employed OPC, which is the de facto standard in the process automation industry, as the interface for state monitoring system vendors. As in the past, we actively work with these vendors to manage more production facilities through functional enhancements. 'PRM' and 'ExaPilot' are the registered trademarks of Yokogawa Electric Corporation.